What Does the Tufting Process Involve? In mattress making, tufting is used to hold the top layer of a mattress to the bottom layers. Tufting helps to secure the different layers of mattress together for longevity and support during the life of the mattress. Here’s a look at the process. First, the manufacturer compresses the materials tightly together, usually with a machine. 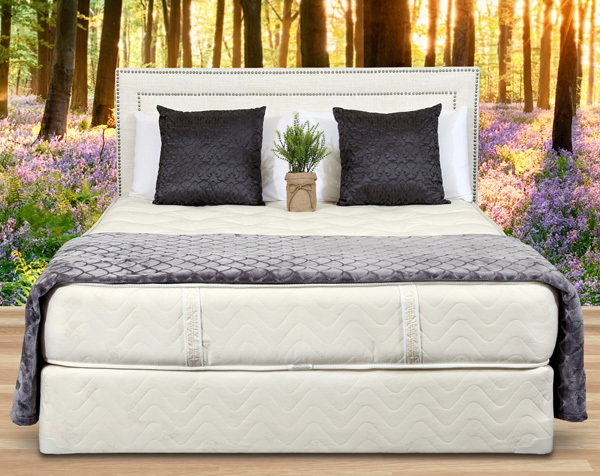 The tufting straps are typically shorter than the overall height of the mattress and keep the points at which the tufts are inserted tight, keeping the layers from shifting or bunching. Once the materials are compressed, the tufting can begin. To tuft a soft layer or a pillow top to a mattress, the manufacturer starts by laying a soft layer of material on top of the rest of the mattress. Then, several tufting points are marked. These are the points where the soft layer is going to be connected to the rest of the mattress. These points should be evenly distributed so that the layers stay together efficiently. Most professional mattress manufacturers use tufting straps, which are thicker and more flexible than yarn or other materials. A thick needle is threaded with a tufting strap to allow the strap to be passed through the different layers of mattress material where the tufting points have been marked. For an organic mattress, the straps are typically made from organic or natural materials. Once the needle has gone through both layers of material, the needle is pulled back up to the original layer. For quality tufting, the ends of the tufting strap should be at about the same point. There should not be a lot of space between the two pieces. At this point, each end of the tufting straps need to be secured or tied off. In the past, many mattress manufacturers used to add a button at this point. That covered the tuft and gave a decorative element to the mattress. However, this trend has decreased in popularity over time. Some people say that button covered tufts are not as popular because people don’t like the feel of sleeping on buttons. However, the buttons typically cannot be felt. With quality tufting, the tufts end up being slightly lower than the rest of the mattress. As a result, the person using the mattress rests more on the raised parts of the mattress, and they don’t feel the buttons. In some cases, the top of the strap has a decorative rosette to cover the knots instead of a button. To imagine how a tufted mattress looks and feels, think of a billowing cloud. There are soft round bits that move up and down like very subtle and gentle waves. These shapes gently support and cradle your body while you sleep. Essentially, tufting helps to hold layers of mattress material together and this technique is especially useful in situations where the top layer has loose fibers that may shift over time. That includes wool, cotton, and latex, as well as other materials. Regardless of the types of materials involved, tufted layers work together to create a consistent feeling of comfort throughout the whole mattress. To keep the depressions in a tufted mattress to be as small as possible, the tufts should be closer together. For a more billowing effect, the tufts should be spaced further apart. Additionally, the tightness of each tuft impacts the overall firmness of the mattress. When the knots of the tufts are pulled tightly together, that creates deeper valleys and a firmer mattress. On the other hand, when the tufts are loose, the mattress feels softer and the valleys are subtler. At Gardner Mattress, all our tufted mattresses are done by hand. We make each mattress to order for our clients, and we pride ourselves on high quality work that provides you with a wonderful place to sleep. Contact us today at 1-800-564-2736 to learn more about how a hand-tufted mattress can give you the best sleep of your life. Previous article	Why Are Factory-Direct Mattresses a Better Value? Next article	Does Flipping Your Mattress Make a Difference?